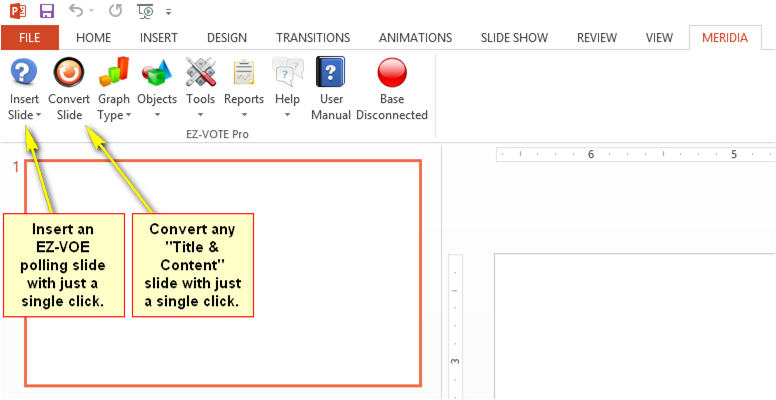 EZ-VOTE Connect includes the easiest, yet capable PowerPoint audience response plugin on the market today. 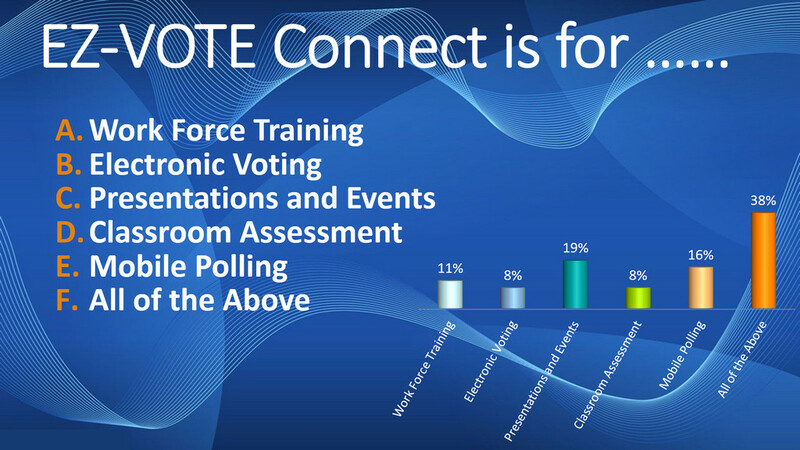 Like the rest of the Connect suite, our PowerPoint polling software is cost-free, subscription-free, and license-free. EZ-VOTE was designed by the training and education community with a focus on ease of use. All interactive slides can be inserted or converted with a single click. Like the rest of the Meridia’s products, EZ-VOTE is fully supported. 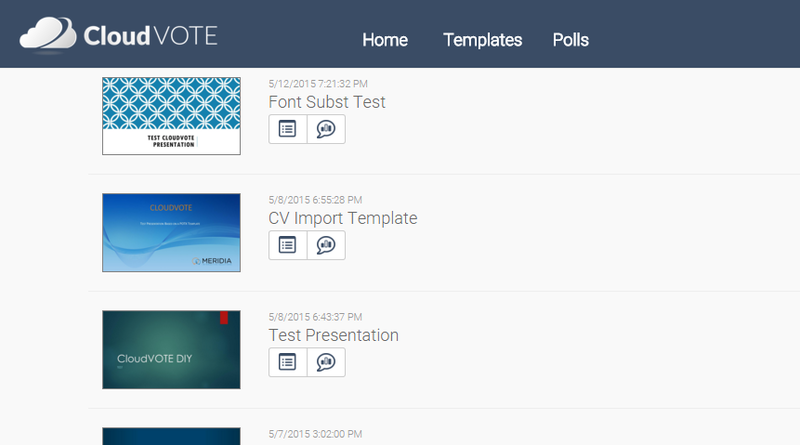 EZ-VOTE is integrated directly with PowerPoint. Interactive polling slide can be inserted with a single click of the mouse. EZ-VOTE is easy enough for standard Q & A polling, yet powerful enough to handle the most complex events. Give it a try. It’s free and no signup is required. EZ-VOTE boasts 14 reports that allow users to store and analyze their voting data. 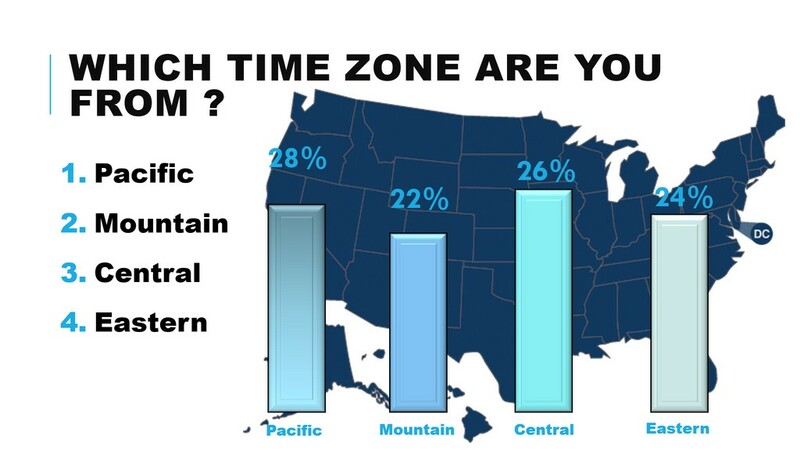 Additionally, each system purchased from Meridia includes 12 months of centralized cloud reporting available via CloudVOTE. 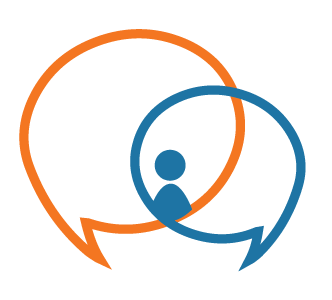 EZ-VOTE provides the user with a variety of comprehensive audience response reports. From question list to participant list, every bit of data can be reported on. If you see something missing, we can customize reports to suit your needs. A comprehensive report containing percentages, total votes, question and answer text, and color pie chart representing the data. This is probably our most popular report because it has just about all the information you need in one place. Shows how each keypad voted for each question. If you have a participant list set up, your descriptors (entry fields) will show up here too. A list of all questions, answers, correct answers, and possible points. No responses are recorded in this report. Hand a copy of this out to the review board so they can follow along. Or hand a copy to the audience as long as you delete the correct answer information first. Similar to the “All Data” report, Graded Results gives individual scoring information as well as individual answering. If you scroll to the second page in the PDF you will agree this is perhaps the worst group of voters we’ve ever seen. With the exception of Keypad 4. Choose any question in the list and filter every other question by it. Want to know how men answered as opposed to women? 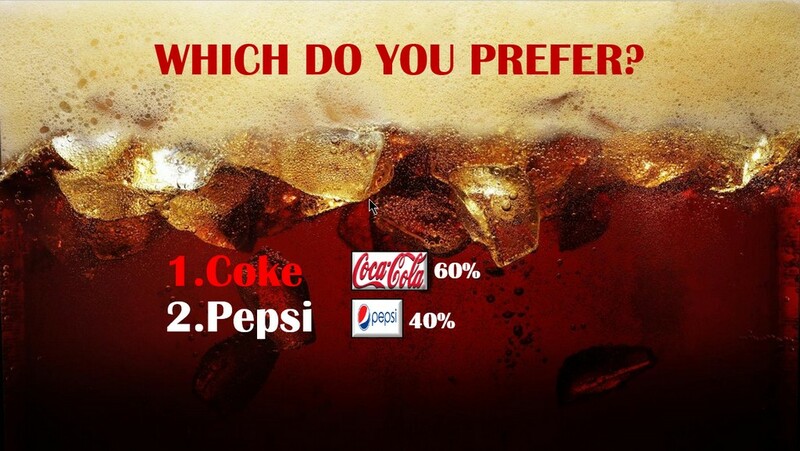 What age group prefers your product? This is where you’ll find out. An easy way to view all of the participants in your list and all the information you’ve gathered about them. All of your custom descriptors, open and closed, will appear here. Happy listing! Each participant is listed here. Underneath each participant is every question asked during the ARS session, how they answered and the correct answers. Depending on the number of questions, each participant may get a page or more to themselves. Keep this in mind when you go to click the “print” button. Side by side comparison of two questions. 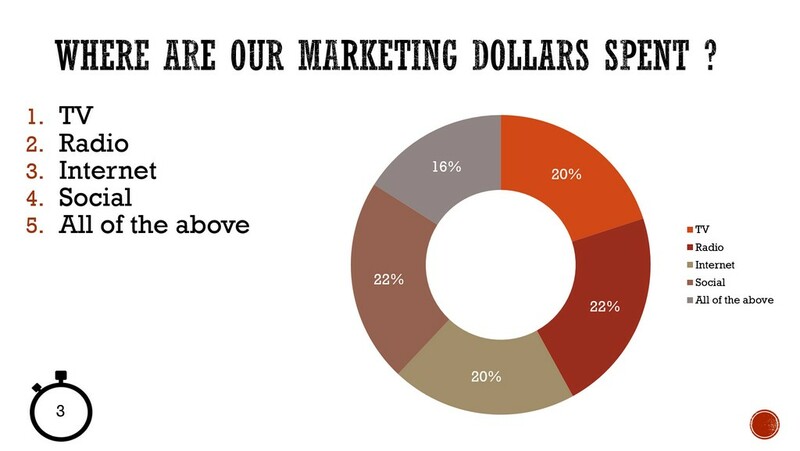 Useful for gauging effectiveness by asking the same question before and after your presentation. This works best with two identical questions, but if you want to get experimental, be our guest. Only for our Elections customers, this report allows you to view and check calculations on election results adjusted by “weight” (voting power) either on an individual basis or by group. Review your participants texted responses. Texting allows for open ended questions and personalized feedback. 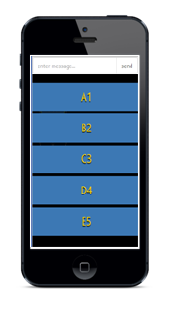 You will need our ProVoteTXT keypads to make use of our texting capability. When you absolutely, positively, must have more than one answer per question, look no further than the Multi-Vote slide and subsequent report. Keep track of attendance numbers, gather information about attendees, run a secret raffle, the possibilities are endless with THIS: the Sign-In Results report. Let us customize a report for you. Impress your boss, make it your own, filter things until there’s nothing else to filter and see clearly why you do what you do. 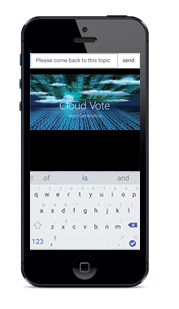 Like other EZ-VOTE Connect apps, our PowerPoint audience response plugin ‘connects’ seamlessly with the CloudVOTE mobile polling and content management platform. It allows users to collect data from both audience response keypads and mobile devices alike. Meridia includes 12 months of mobile polling, cloud presentation storage and centralized reporting with every system we sell. Presentations created in our EZ-VOTE PowerPoint audience response plugin will automatically be synced to your CloudVOTE account. Plus, you can invite your mobile audience to any of the EZ-VOTE slide shows with just a click of a Mobile Polling button on the toolbar. We are not turning our backs on you. Our software does not need internet to ‘check in with the mothership’, or to connect with the clickers. It is not limited by a seat license or an active subscription. Once you activate your license, the audience response keypads will work with the desktop polling software forever, regardless of whether you are using 10s or 100s of them. We will never limit your ability to use the hardware and software on the desktop once you’ve purchased it, even when your free cloud subscription expires. U.S.-based training and technical support comes standard. From training videos to live one-on-one training and vast knowledge base, you will start using EZ-VOTE as a pro in no time!